Part of my goals this year as preparation for moving to California (assuming it happens) has been to weed through my book collection. I have several hundred reference books and a couple thousand paperbacks. Most of them I moved down here from Toronto (my husband moved about 30 comic boxes & several hundred hard cover roleplaying game books – the movers HATED us). But, we’ll likely have a much smaller place in California and I’ve been focusing more on ebooks so it seems to be time for a significant purge. My criteria were to keep books I’d read more than once & would likely read again. I’m a CHRONIC re-reader. For all that writing takes a huge bite out of my reading time, I read fast and for me, the point of a story is the story, not the surprise ending. I don’t care if I know how the story ends, if you’ve written a good story, I’ll re-read it just for the pleasure of the storytelling. There were a lot of “oh yeah, that was a great book” moments, and I came across an old favourite series that I intend to re-read in 2013. Remember these? 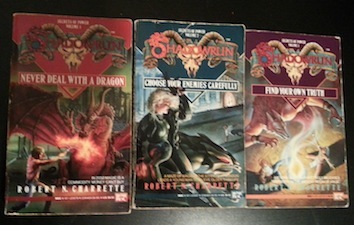 Shadowrun? Early cyber-punk /fantasy crossover and I have to tell you, the concept of implanting hardware into your brain to connect directly to… well… the internet, I guess, was mind-blowing. Even some of the descriptions of “jacking in” have stuck with me to this day. Back in the day, my hubby (then boyfriend) and I invested in the roleplaying game and played a few campaigns as hackers against the corporation. Actually, I think the character I developed for this game was something I called “gender neutral”. Anyway, hubby tells me he thinks they’re releasing a new edition of the game. Along with my re-reads, I’d be quite interested to see how they changed the concepts (and how much they’d have to change) since I dabbled with it in the early 90s. But we’ll need to get to know some gaming geeks in California, first. Although… hubby has had some success roleplaying with his old group back in Toronto via Google Play. Perhaps it’s time for us to update our tech as well 🙂 That can be another goal for 2013. Oh, and I did manage to purge about 500 paperbacks and maybe 50 reference/text books. Go me! My daughter is a chronic re-reader, too. But she’s switched to ebooks and can now carry her entire library in her hand everywhere she goes. She loves it. The hubby plays some online RPGs, but I find learning games online to be rather tedious. Which is probably a little odd for a sci-fi writer. Oh well. I did a book purge. I don’t think I’ve hit 500, though. But my criteria was the re-read. Will I ever re-read this book? If the answer is no and there was no strong compelling reason otherwise, I had to put it in the donation box. Good luck with the (maybe) move to California. Thanks, Ella – and that sounds like my process 🙂 I had lots of stuff going to Goodwill! 500!! Wow, I’m in awe, KC. LOL, Anna – there’s still soooo many left! Reference books are the ones I have the hardest time purging. I *might* need them at some point. Whereas for a novel I’m usually quite sure whether I want to re-read it or not.